Your air conditioner is one of the most precious appliances in your home. It keeps your temperature at a reasonable level — and if anything goes seriously wrong, it can be very expensive to fix. Most home owners will spend between $3,679 and $7,165 to install a new air conditioning unit. That’s why it’s a smart move to get as much life out of your current unit as you can — and doing that means performing proper maintenance on your air conditioner year in and year out. With good air conditioner maintenance, you can extend the life of your air conditioner and keep it in good working order for years to come. Replace your air filters: This is one of the most important ways to maintain your air conditioning unit, but it’s also one of the easiest and cheapest. If they’re not changed often enough, a dirty filter can place unnecessary strain on your air conditioning unit. They should be cleaned monthly and changed once every three to nine months. Check your owner’s manual for specific recommendations on your unit. Clean ducts and vents: An air duct cleaning as well as a vent cleaning can increase efficiency, improve the lifespan of your air conditioning unit, and give you cleaner air to breathe at home. 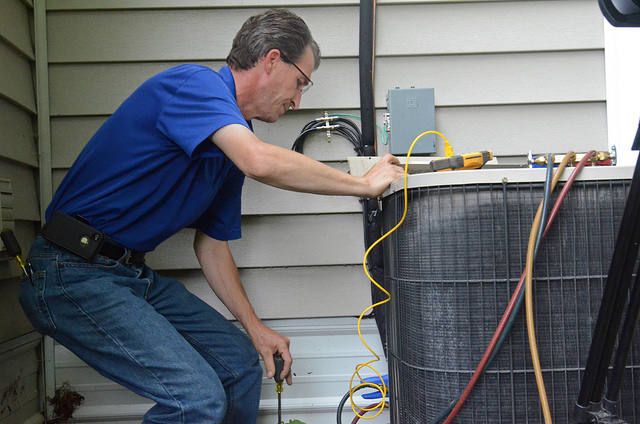 Clean your air conditioner coils: The evaporator coil and the condenser coil will collect dirt over months and years, which can reduce airflow and insulate the coil — ultimately reducing its power to absorb heat. You’ll need to check your coils every year and clean as needed, removing dust, buildup, and particularly foliage to keep things operating smoothly. Prevent debris in your unit: Even better than cleaning debris from your unit is keeping it from ending up there in the first place. It’s a good idea to trim foliage back two feet away from your air conditioner unit to ensure you’ll have adequate air flow. Create shade for the outside unit: If your air conditioner is struggling to keep up with summer heat, consider adding shade for it to make it easier to operate and place less of a strain on the unit. Just be careful not to block air, as that can cause a serious problem as well. Comb coil fins: Evaporator and condensor fins are made of aluminum and can be easily bent. This can result in blocked airflow and should be fixed. It’s easy to take care of this task with a fin comb, sold by air conditioning wholesalers, which can come the fins back into position. Inspect the condensate drain: Take a look at your condensate drain at the start of each season. You should check to make sure the drain isn’t plugged up, as this can cause water damage and increase indoor humidity levels. Inspect refrigerant lines: Ensure that refrigerant lines are intact. If there is any damage or insulation is missing, be sure to replace them immediately. Inspect the fan motor and blades: Look for wear and damage on the fan motor and blades. You should also lubricate these parts as necessary. Check the air conditioner refrigerant level: Take a look at how much refrigerant your air conditioner has. Ensure that it isn’t too high or two low, as either will make your system less efficient and can damage the equipment. This maintenance typically requires the help of a professional. Clean your air conditioner condenser unit: Each year, you should clean your air conditioner condenser unit. This can be done in about an hour and is easy for anyone to take care of. Level your air conditioning unit: While you’re cleaning the unit, be sure that it is on firm, level ground. Use a leveler to check, and then add pads as necessary to level out the unit for the best performance and longevity. Cover your air conditioner unit in the winter: When you’re done using your air conditioner for the year, be sure to cover it up before winter storms and debris come. This can protect your air conditioner unit from damage and dirt that can interfere with its lifespan and normal use. Keep most of your home’s vents open: Be careful not to close more than 20% of the vents in your home. Doing so can place an unnecessary strain on your air conditioner. Follow these tips for proper air conditioner maintenance to get the most performance and life out of your unit. You can potentially save thousands on an air conditioning replacement simply by keeping your air conditioner in good working order.